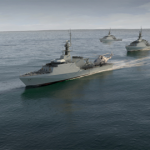 The U.K. defense ministry has awarded BAE Systems a potential $361 million contract to build and deliver an additional two offshore patrol vessels to the country’s naval force. The construction of HMS Tamar and HMS Spey brings the total number of the Royal Navy’s River-class OPVs to five ships that are scheduled to enter service in 2018, the U.K. government said Thursday. OPVs are designed to perform maritime defense, counter-terrorism and anti-piracy operations for the Royal Navy and navigate 5, 500 nautical miles at up to 24 knots in maximum speed. The U.K. government expects both ships to be delivered in 2019 and equipped with a 30mm cannon and a flight deck designed to accommodate a Merlin helicopter. BAE said Thursday it will also provide support services for five ships under the OPV program, which could bring the total contract value to approximately $799 million. Harriett Baldwin, U.K. defense procurement minister, attended the steel-cutting ceremony for HMS Tamar at BAE’s Govan shipyard in Scotland. BAE also built the first three OPVs – Forth, Medway, Trent — for the U.K. navy. The company is scheduled to deliver the Forth and Medway vessels in 2017, while Trent is in the assembly phase at Govan shipyard. Tags BAE Systems Contract Award featured Forth Govan shipyard govcon Harriett Baldwin HMS Spey HMS Tamar Medway offshore patrol vessel River-class OPV Royal Navy Scotland shipbuilding Trent u.k.